"I received this plant approximately 4 months ago at my grandfather's funeral. Since that time, it has not seemed to flourish. I have tried to water it frequently, keep in sunlight when possible and also kept the temperature inside at approx. 65 - 75 degrees. It has begun to thin out, droop, leaves turn brown. I do not know what to do for this plant. Am I doing all the wrong things? I am not a plant person, but I would really like to save this one since it was given to me in my grandfather's memory. I have not changed the pot it is in. Do you think it needs to be put in a bigger pot? Warning!!! The sap of the Dieffenbachia plant is extremely poisonous! that it will close your throat and cause suffocation. Contact with the skin can cause severe irritation or rashes. Wash your hands thoroughly after you have any contact with the sap! Dieffenbachias grow best in the bright indirect light of north or east window. The ideal growing temperatures are between 70° to 80° F. during the day and 60° to 65° at night. 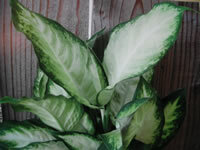 Dieffenbachia plants will perish if kept below 50°! and then the plant should receive a thorough drenching. with any all purpose house-plant fertilizer diluted to one half strength. using any good commercial potting soil. to prevent the pores from being clogged with dust. This natural function allows the plant's energy to be diverted to the production of new top leaves. If the plant becomes to tall and leggy, it can be cut back to any height and the cut portions used for propagation. The uncut portion of the cane will then begin to branch from the old leaf nodes.